The glitch with Maxine’s gift has now been corrected. Find her in BuildaBearville to get your free gift – The Stack of Books on Head. Thanks to our resident Cybearguides for the information! 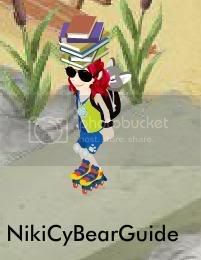 Here is NikiCyBearGuide modeling her very own stack of books. Maxine’s April Gift to Members — Gardening Bag! Maxine’s May Gift – Love Hugs Peace Plant! Maxine’s Buildabearville October Gift: Bear Paw Visor! Next post: BuildABear Workshop Celebrating Bear Birthdays?